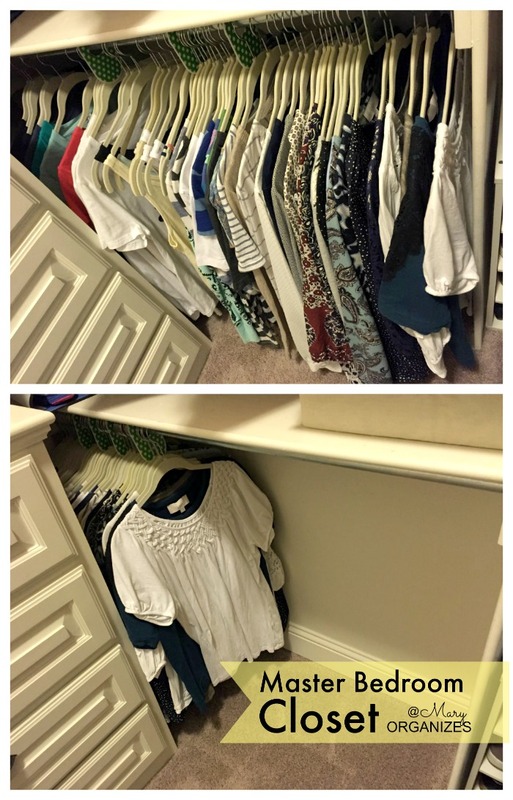 Up until now I’ve not shown much of my closet on the blog. It isn’t because it is a big secret, I really just don’t know how to take pictures in closets very well. I’ve decided that doesn’t really matter, because if you are still reading my blog after all this time, you’ve already discovered I’m not an amazing photographer, but you’ve decided to read it anyway. 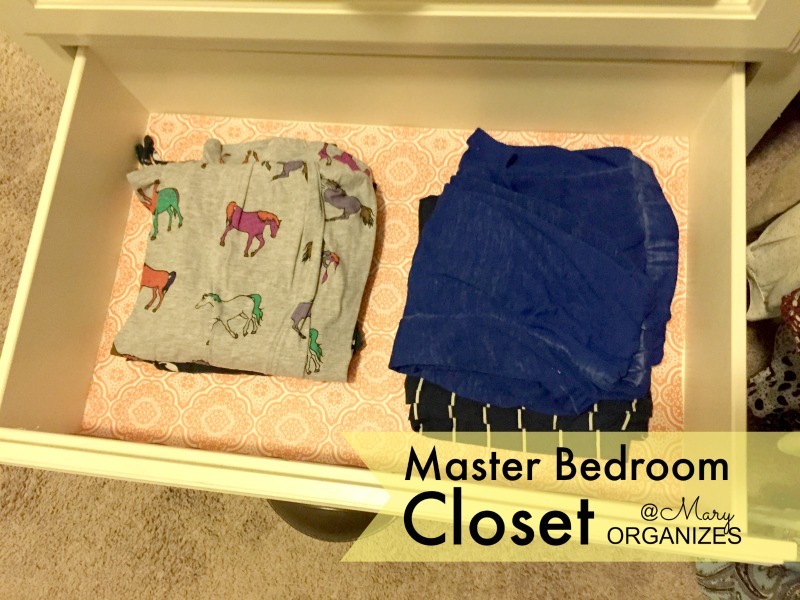 So here it goes, a little picture tour of our master bedroom closet. Have you ever noticed you tend to fill whatever space you have with stuff? 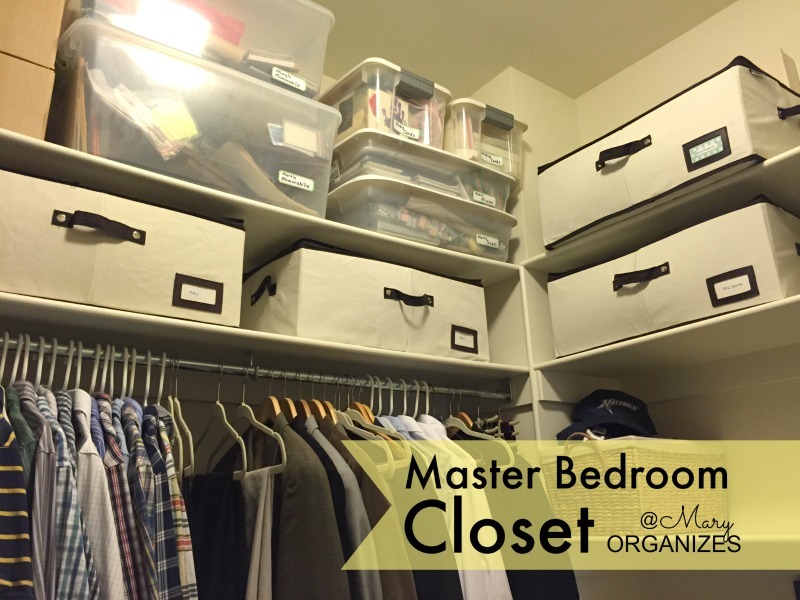 For this reason, an enormous closet isn’t too important to me. I just need something that fits our clothes, and my closet actually fits more than just our clothes as you will soon see. 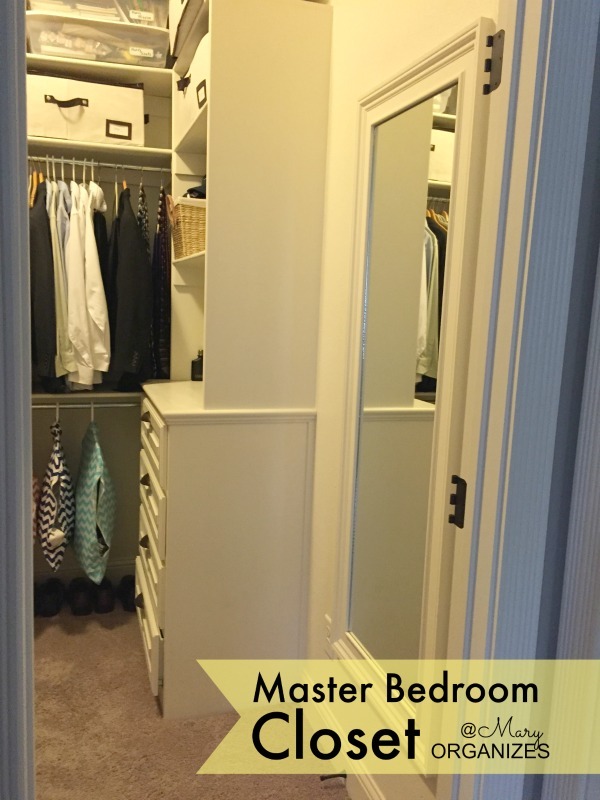 The closet connects to our master bathroom. We removed the door to make access easier. 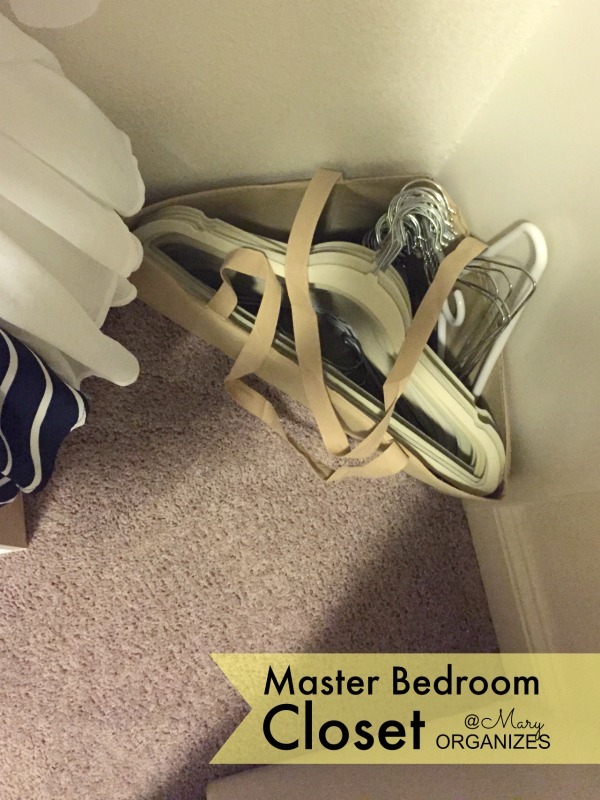 On my side of the closet, I have hooks for my robes. I have a light summer robe and a heavier winter robe. 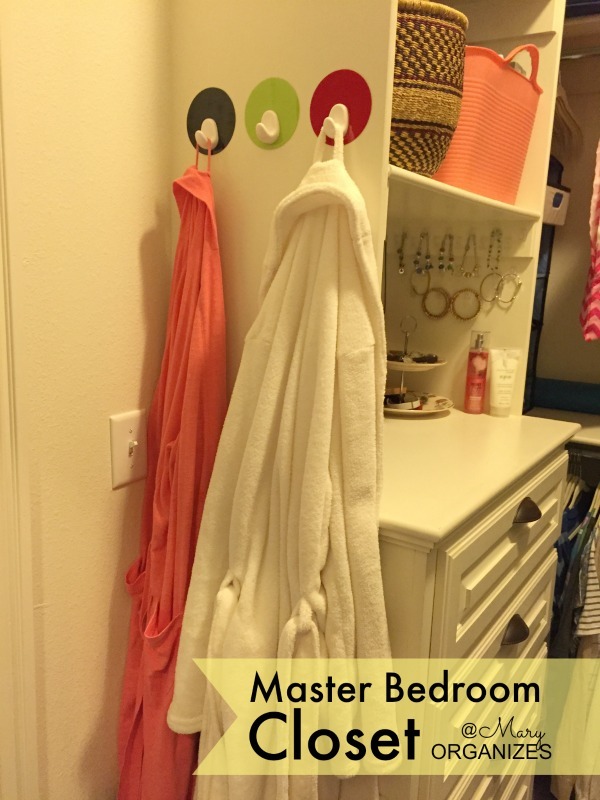 There are more hooks underneath the robes where I hang my swimsuits. On the shelves on my side of the closet, I hold my jewelry on the bottom, and the middle holds gifts I’m holding until the right time to give them. I keep a few spare birthday presents for kids parties, baby gifts, my kids when I see something I want for them ahead of a birthday or holiday. 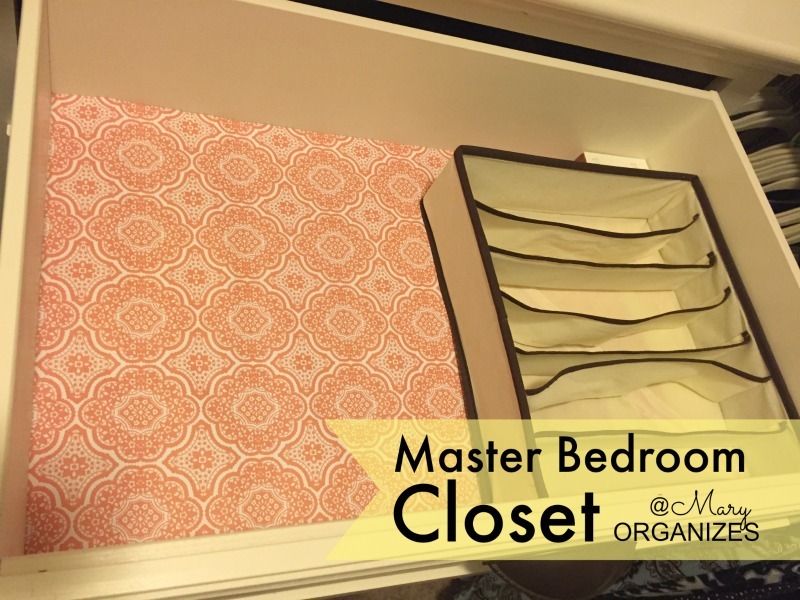 This canvas container holds heirloom quilts. All of the canvas containers in the closet hold different things. 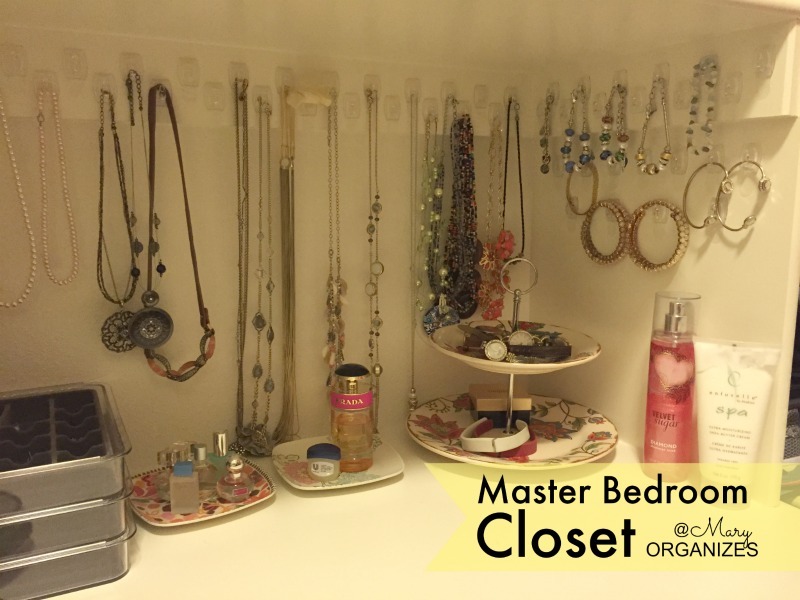 My jewelry organizing isn’t so original, but it makes it easy to accessorize. I use hooks for necklaces and bracelets. The two-tier plate holds watches and my fit bit stuff. The two little plates in the middle hold my perfume. The containers on the left hold earrings, and rings. They aren’t very full. The bottom one has some of the jewelry my girls have created for me over the years. The little bowl has my favorite pair of earrings that I wear 99% of the time. And of course I like having body spray and good lotion in my closet. Same stuff in this pictures, just a different view. 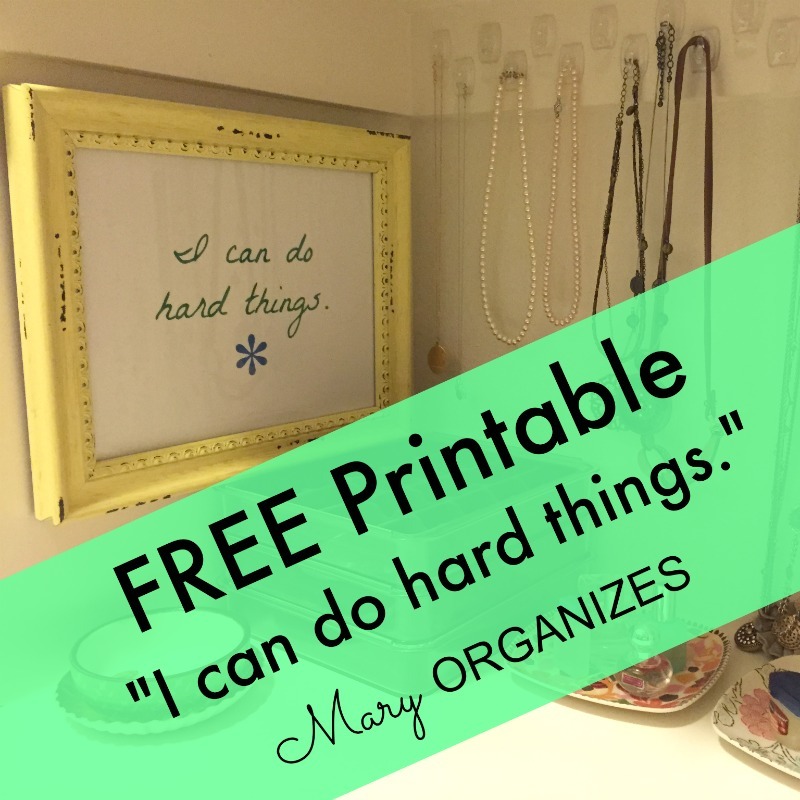 A quote I tell myself all the time, always trying to convince myself it is true is that “I can do hard things.” Just in case you might enjoy a similar daily affirmation printable, I will share mine to download HERE. 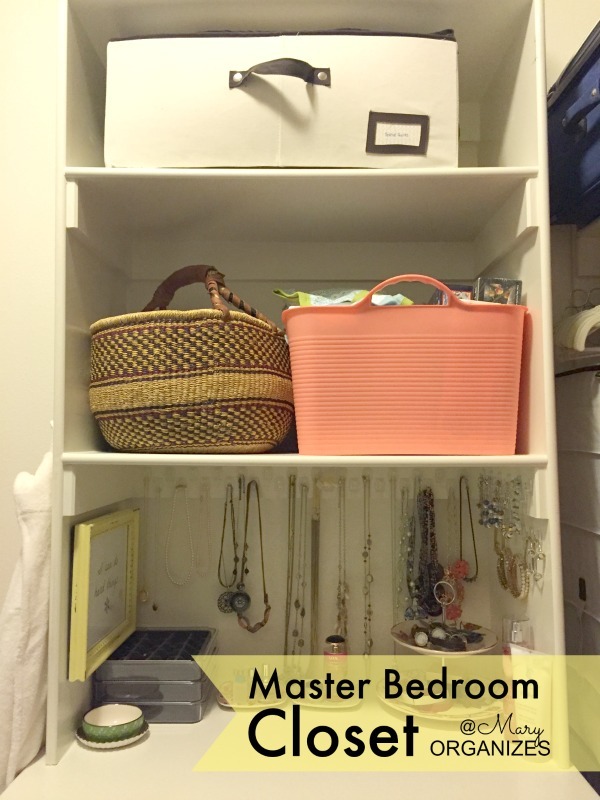 The top drawer holds my bras and underwear. I did remove those for the picture because that just seemed like the right thing to do. 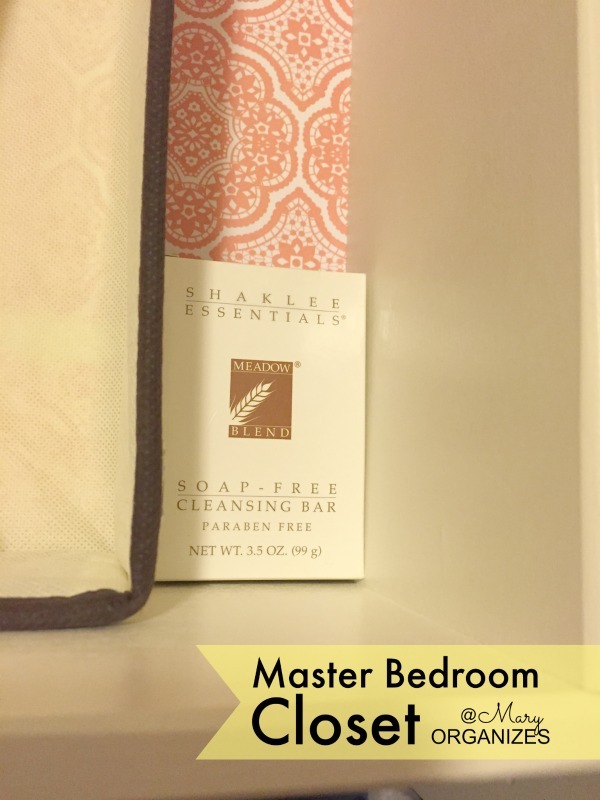 I keep this soap in my drawer because it smells fresh and keeps my under-things smelling fresh. This drawer has my socks, scarves, and belts. This drawer has my nightgowns and t-shirts I wear as pajamas. This drawer has pajama bottoms. I sewed the horse ones myself. When my girls saw them for the first time, they made sure I knew that they should NOT be worn as pants out of the house. Message received. This is my side of the closet with hanging clothes. We keep our suitcases and travel bags in our closet. This picture collage shows my tops and under-shirts. I use those green dividers to separate types of tops. I spread the hangers out so I can see what I have. If I push them all together, you can see that I don’t have my shirts packed in there. Honestly … It is a universal truth that the smaller you keep your wardrobe, the bigger it feels. When you keep only what you love, you see endless possibilities in the closet instead of endless maybes. I’m short, as I’ve told you before. The upper hangers are not high for most people, but they are kind of high for me. I use this higher bar for my dirty laundry bags. My yellow hanging bag has hand-wash items and the pink bag has my delicate wash items. I don’t wash any of my clothes on “normal” and I hang dry 97% of it. I want my clothes to last a long time! 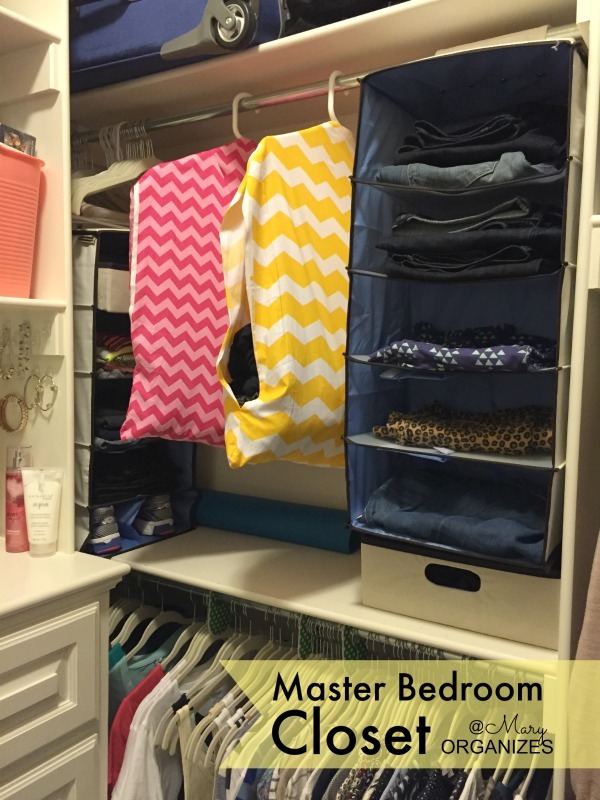 In these hanging shelves, I use one for my pants and the other for my workout clothes/shoes. 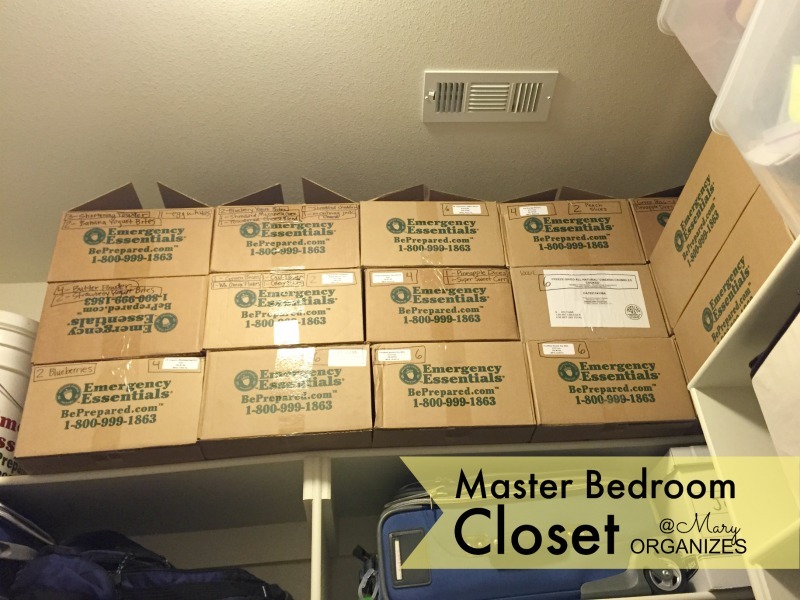 The ceilings are tall in the closet, so we use the higher shelves to store long-term food storage items in case of emergency. On this other side of my hanging clothes, I hang my sweaters, skirts, and dresses. I took another picture of them scrunched together to show a better idea of the quantity. Here are my shoes. All of them. I even took off the ones I was wearing as I took pictures and put them in here. I decluttered some worn out sandals, so I’ll be adding a few more pairs of sandals before summer. When I like a certain kind of shoe … that is what I buy, in multiple colors. Call me boring, but comfort matters! 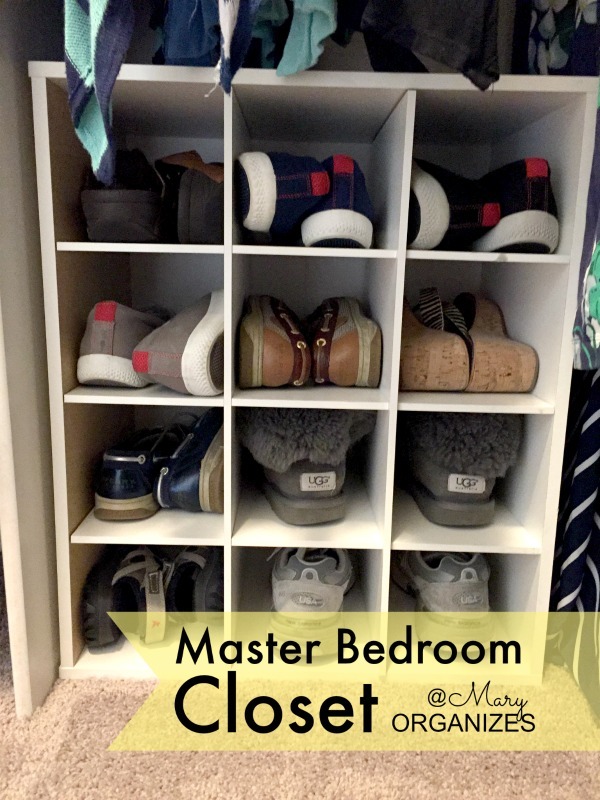 I was pretty close to getting rid of my Uggs decluttering last round, but decided to keep them since I have room and I wore them two times this winter. They will be the first to go when new shoes come in. One in one out keeps things under control! The tennis shoes in here are my older pair, so now I use them for yard work. This little hanger basket is in the corner under my hanging dresses. I like having spare hangers as hangers break, etc. This is the top of Matt’s side of the closet. We each have a plastic bin for memorabilia from our pre-married lives. We also have a bin for wedding and baby memories, and a bin for my husband’s scouting achievements and 2-year mission letters, etc. The canvas bags have an assortment of things. One of them has old t-shirts of my husbands, which represents a compromise. The other canvas bins have white clothes (my wedding dress, blessing gowns, baptism gowns), baby blankets, and baby clothes that tug at my heart-strings. I have a sentimental side, I just keep it in check with boundaries. Matt’s clothes. Any clothes you see that are not the color blue was a blatant attempt of mine to add color to his wardrobe. The guy likes his navy and white t-shirts. His clothing requires more load types than mine, though I put some of my pure whites in the gray bag with his. Matt’s shelves and drawers. That basket has his hats, and his drawers are pretty typical boring guy-drawers full of socks, shorts, and belts. His picture hanging of the water was a gift from me. It is a meaningful memory we share. 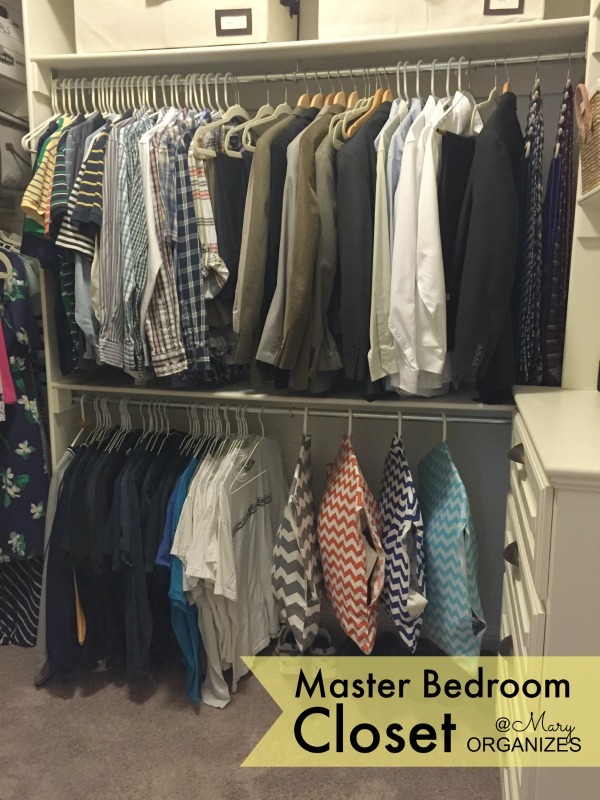 That’s it, that’s my master closet. I’m so glad you can check that off your bucket list now. Ha! 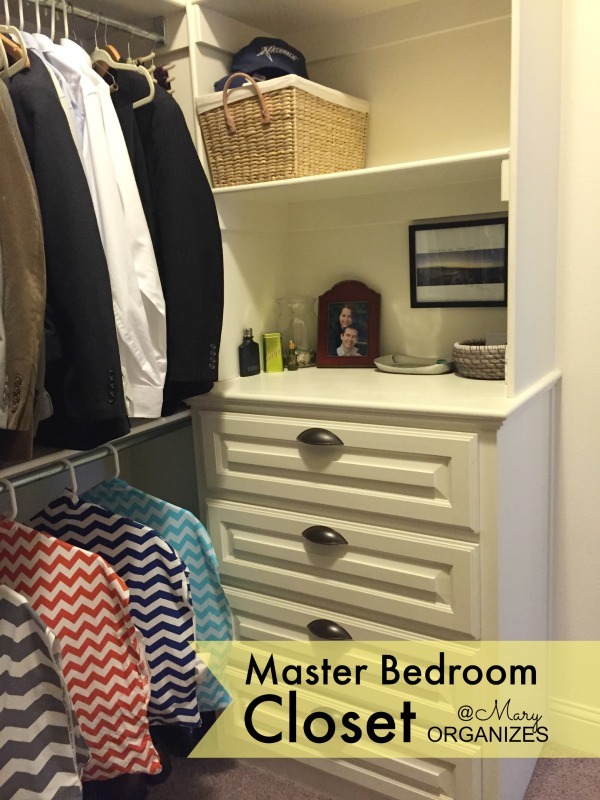 You have a beautiful closet. Very nice. Thank you, Mary! 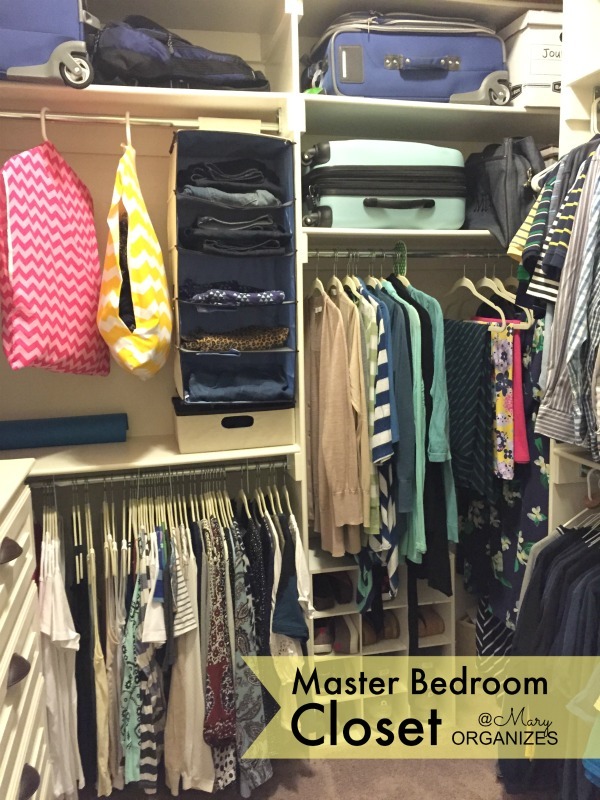 I love everything about this closet! So glad you shared! 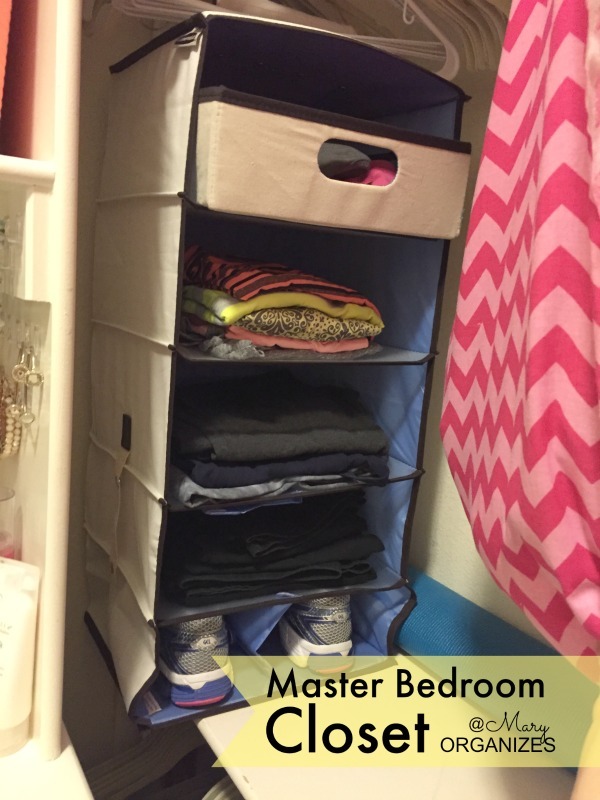 We inherited a terrible closet, one that was put caddy corner in our bedroom, so the layout is weird and figuring out what to do with it is terrible, but this gives me many ideas! Love ya! This makes me so happy to help a little. 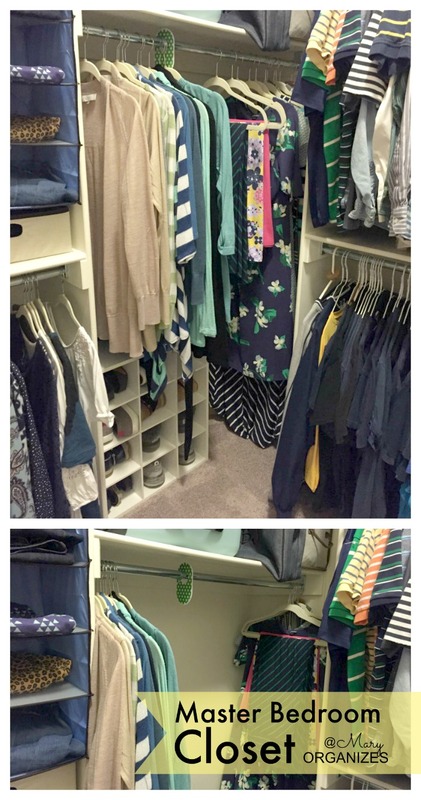 The closet in our home was a “compromise” when we loved the rest of the house, but we’ve made it work. You’ll figure out your space too! 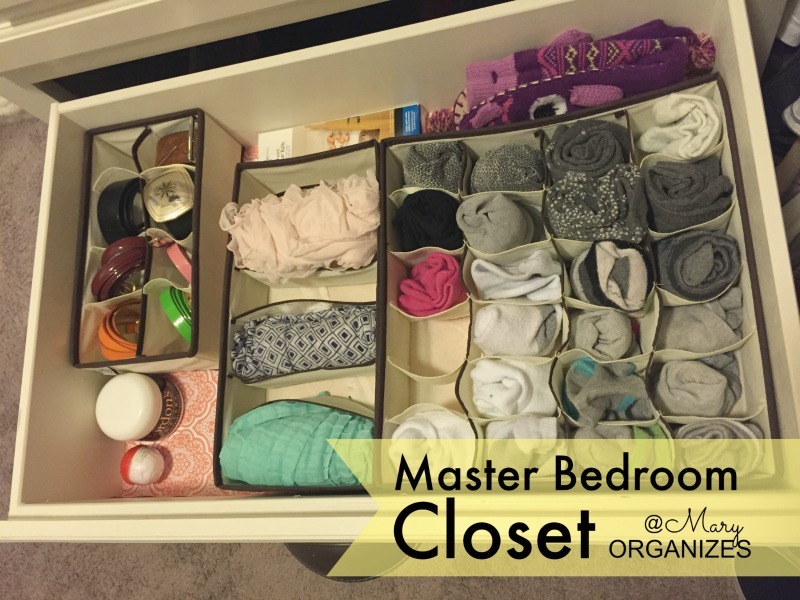 I love how your closets are organized ! It looks so peaceful and I bet you don’t dread going in there ! I got some ideas. Love the Shaklee soap bar idea. I never find sachet scents that I like. Guess that will be on my next order ! Thank you, Suan! It is peaceful. I’m picky on scents too! I got the idea from a friend who puts her favorite candle scent in her drawer and it worked for her … so I thought this would work too. Love your closet Mary. Thanks for sharing. Where did you get your containers for your earrings? 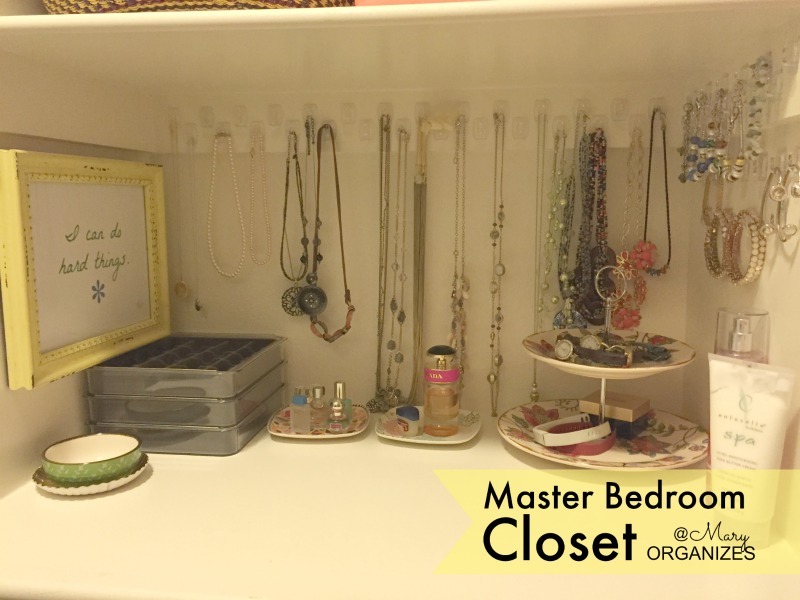 I hang mine up in a jewellery organizer but it is difficult to find them as there are so many in one compartment. I know…..I should declutter but I do love them and I do wear them……well most anyways. I got these at Target. I saw them on clearance the last time I was there, so I’m not sure how much longer they’ll be carrying them. I feel like we shared a secret, thanks. I think I’m going back to my closet this week. Sounds like you made quite a dent in your collection. 30+ years. Wow!!!! Okay, I knew I liked you from the start, but now I REALLY like you knowing that you too have taken steps to keep your family stocked with emergency supplies…you just never know! I love this! I also have preparations in place just in case. For water purification I would recommend a Big Berkey. You will have to check them out and see what you think. You can put pond scum in and it comes out pure and clean. Thanks for letting me know. I will definitely check that out! Mary, your closet is beautifully done. Unfortunately for me, your closet is about the size of my bedroom. 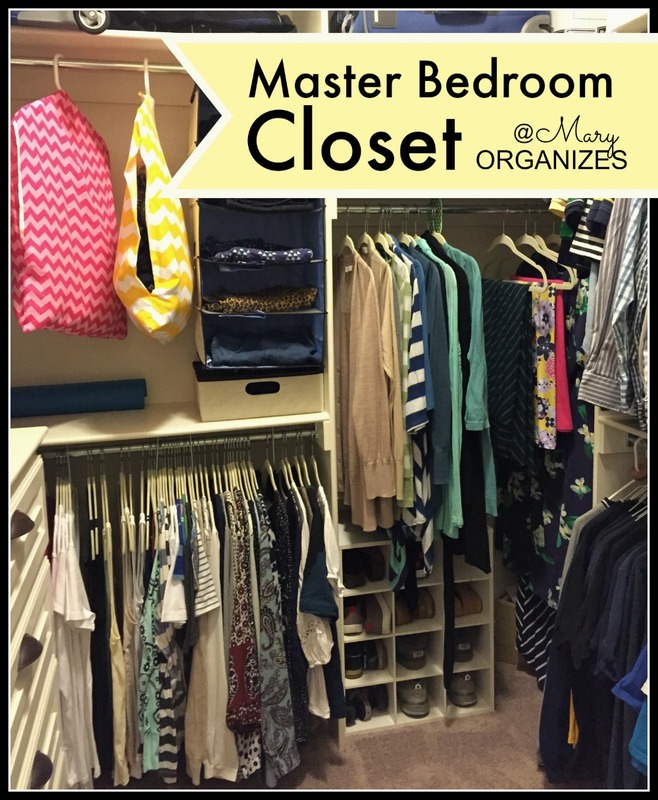 I find that people organizing closets and bathrooms, even laundry rooms have rooms much larger than mine. When a space is smaller, it’s even more important to use every bit of it wisely. 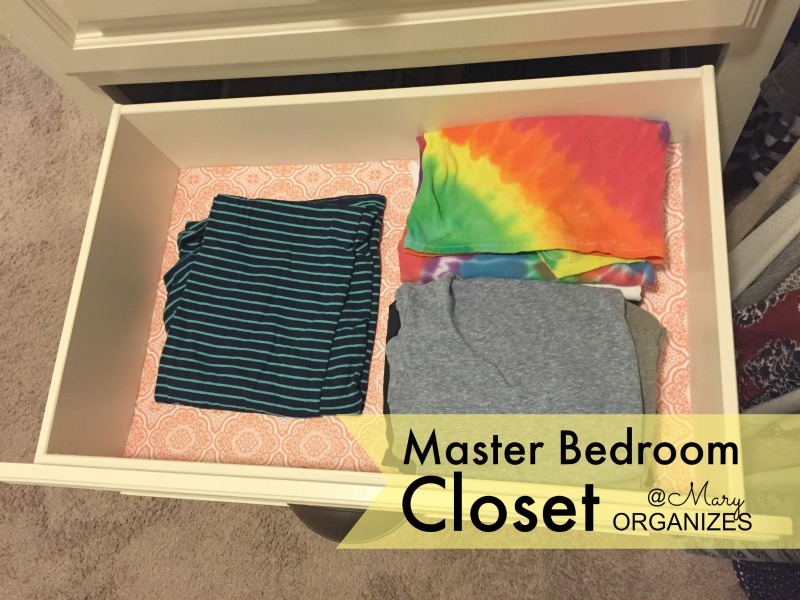 Best of luck getting your space organized!